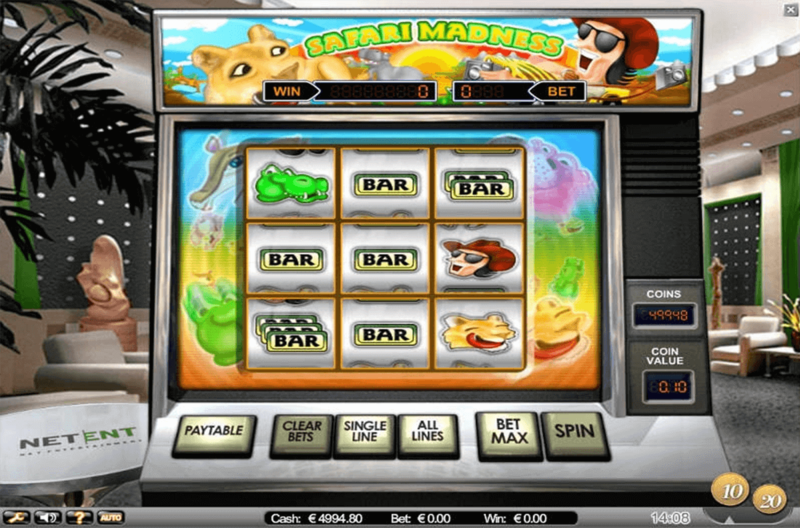 Developed by Net Entertainment, Safari Madness is a classic slot game and has 9 reels and 8 paylines. With a safari theme, Safari Madness includes symbols such as lion, crocodile, hippopotamus and giraffe. It also includes a jeep, happy tourist and the classic bar symbols. Safari Madness has a payout percentage of 96.70%. Safari Madness comes with 6 main buttons and these control the game. The paytable button has a list of winning combinations. The clear bets button will remove all the bets on a particular payline. The single line button allows players to bet 1 coin on one payline and can be pressed more than once to add more bets. The all lines button bets one coin on all the paylines (8 of them). The max bet will bet the maximum bet on each of the paylines and amounts to 64 coins. The spin button will begin the game by spinning the reels with the players betting options selected. Players are also able to activate the autoplay feature which will spin the reels automatically until players want to spin them manually. The sound can also be adjusted using the controls on the bottom left of the screen. Although there are no wild symbols or bonus features, Safari Madness is a fun slots NZ game which is easy to play and has a low betting range. Players can choose from between 1 to 8 paylines and a betting value of between 1 to 10 coins per payline. For those players who do not choose the maximum bet they will have to choose their bet using the single line button and players should be aware of how often they make use of this button. The betting range is low so is especially suited to players starting out or those who play on a casual basis. Players are able to stop the reels spinning by using the spin button which will stop the reels in mid-spin, which is a great feature. Players can choose their bet option and begin playing by using the spin button or press the bet max button to play the maximum bet. Safari Madness has 3 horizontal lines, 3 vertical lines and 2 diagonal lines and each of these win lines can be activated as many as 8 times, which means a player has up to 64 ways of winning. The happy tourist with the red hat is the highest paying symbol and if 9 of these appear on the reels players can win the jackpot of 3 000 coins when playing with the maximum bet. If eight of these tourists appear players can win 1 000 coins also when playing the maximum bet. The Bar symbol in Safari Madness will pay out when nine of these appear on the reels and players can win 700 coins while playing at the maximum bet. Safari Madness does not have any bonus or scatter symbols and does not have a wild symbol. No bonus features are activated during this online slot game and Safari Madness does not have a gamble feature.